Roaming Stamper: Quick Card Thursday! Additional notes: Flower Power Simply Sent kit will be available beginning August 11th. This kit is designed to make 9 cards. Complete instructions included. Some additional supplies required such as ink and adhesive. Cost of kit is $15.95. I will be doing a Flower Power class in September. 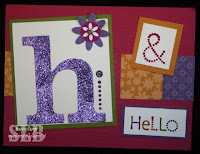 In this class we will make 10 cards (2 each of 5 designs) using the kit and additional supplies. The cards will not be the same ones shown in the kit. The class will be $20.